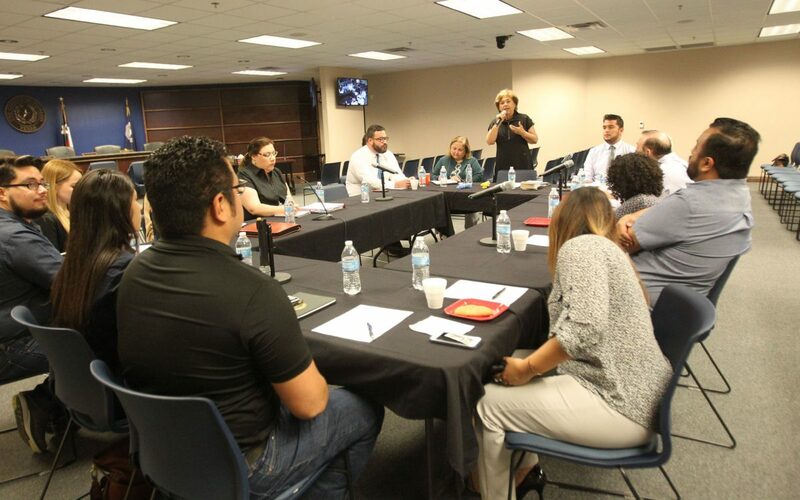 Local media representatives meet with U.S. Census and Hidalgo County officials Thursday in Edinburg. EDINBURG – The same day a federal district judge allowed a lawsuit to continue that will challenge the Trump administration’s citizenship question on the next census, local officials began planning ways to more accurately represent the Rio Grande Valley in 2020. On Thursday, U.S. District Judge Jesse Furman of New York’s southern district denied the administration’s motion to dismiss a lawsuit from various states, counties, cities and advocacy groups regarding a question on the 2020 census about citizenship status. The administration claimed the Department of Justice was concerned about voter fraud and that the question would promote the Voting Rights Act. 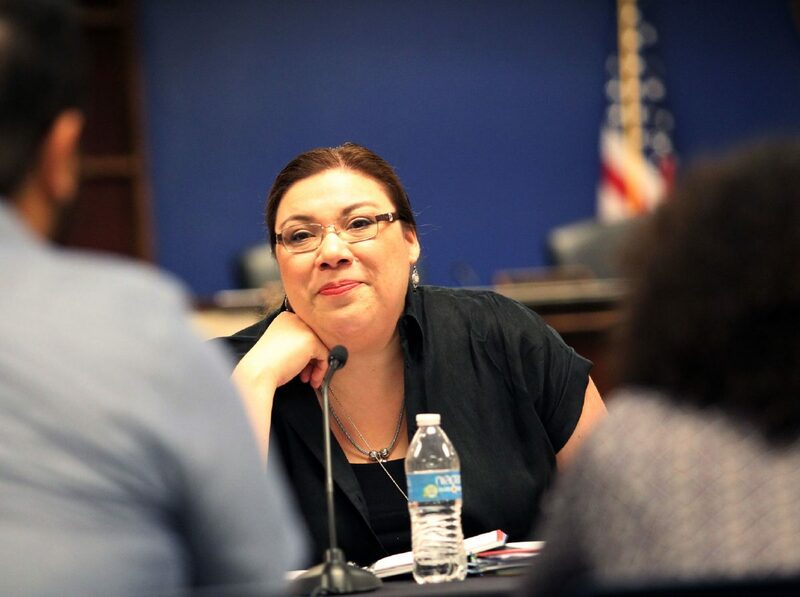 Ana Leonard with the US Census Bureau during a sub committee meeting for the U.S. Census at the Hidalgo County Commissioners Court on Thursday, July 25, 2018, in Edinburg. However, Furman ruled that released emails from Trump’s presidential campaign and his vulgar comments about African countries indicate discrimination could possibly be the basis for the question. As a result, Hidalgo County became an “active participant” in the lawsuit, according to Erika Reyna-Velazquez, Hidalgo County Judge Ramon Garcia’s assistant chief of staff. She led a discussion on the census during a media committee meeting Thursday morning at the county annex building, where representatives of local elected officials talked with the media about how to educate the public on the census’s affect on the region. With county’s population growth, more people accounted for means more federal funding and political representation. The citizenship question, however, was hardly discussed. That fear has heightened amid family separations and deportations, which the Valley continues to be at the center of. With the large local population of immigrants, those at the meeting emphasized the sense of distrust toward the federal government that would make an accurate census count difficult to achieve. Ana Maria Leonard, the U.S. Census Bureau’s representative for the Rio Grande Valley, was adamant that the census is classified and will not endanger anyone. U.S. Code Title 13 guarantees the confidentiality of all respondents in the census. The information is disseminated to other federal agencies only on a statistical basis, but no personal information is released. This means ICE and Border Patrol have no access to any names, addresses or numbers of those who filled out the census forms. Despite the assurance, members of the media committee remained skeptical that Valley residents will participate in large numbers, citing obstacles faced during the 2010 census. One major issue was the lack of Valley-bred enumerators — the people going door-to-door, asking the questions on the census questionnaire. Reyna-Velazquez said the bureau had trouble hiring enough local enumerators, so they brought in Spanish-speakers from Puerto Rico. But the vast differences in dialect led many locals to refuse to open the door. Reyna-Velazquez and Leonard used this example to highlight the need for Spanish-speaking locals to apply for the job, which they can do beginning Sept. 4 of this year. However, only U.S. citizens may be hired. Perhaps the biggest problem with the census is that the population of the Rio Grande Valley has historically been undercounted. The county judge’s staff estimates that the area has lost $158.7 million over 10 years for every 10,000 people not counted. This is due to many hard-to-reach areas, such as colonias or households with non-citizens, going unreported to the U.S. Census Bureau and therefore not being included when the bureau sends enumerators out to neighborhoods. Leonard is not currently authorized for interviews and could not give an answer as to where the bureau gets their information or why so many are unaccounted for. But Judge Garcia’s office has set out to find the uncounted houses. LUCA, or Local Update of Census Addresses, is a project headed by Garcia’s administrative assistant Nector Lopez. Lopez is part of a team using satellite images to count individual houses in the smaller municipalities of Hidalgo County. His team found and mapped 23,711 addresses that were not previously listed. He estimates that three to four people – probably more – live in each house. Now that local officials know these houses exist, they will attempt to reach those people. If the Valley has an accurate census count, it could mean millions more in funding for education, health care, infrastructure and more. For information on the 2020 census, visit www.census.gov.